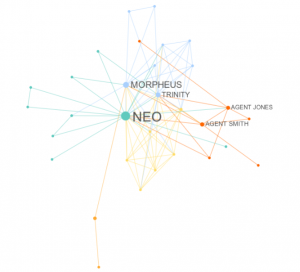 "The Matrix is a system, Neo" or is it a graph? Graph enthusiasts Jermain Kaminski and Michael Schober use graphs to represent social networks in film through their project Moviegalaxies. The duo create a new cinematic experience by utilizing the social interaction graph in movies and helping viewers discover new relationships through smart algorithms and data processing. From analyzing these social networks in movies, Jermain and Michael have interesting insights on network density. For example, adventure movies like Lord of the Rings: Return of the King often feature more sparsely-knit networks with characters (or nodes) interacting across sub-clusters. Romance movies like My Best Friend’s Wedding tend to have higher network density with less nodes that have stronger connections (or edges). This is understandable as in romance movies, two main characters are in frequent and direct communication with each other creating a smaller network with more edges. To learn more about Moviegalaxies, check out their website: moviegalaxies.com.